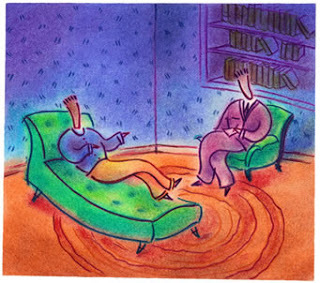 Though I understand that the relationship began with commercial exchange as a method of trying to alleviate extreme emotional distress, one of my favorite personal connections is the one I have with my therapist, Dr. T. She is a willowy china doll of a human being with giant blue eyes and perfectly straight cornsilk hair. She is tall, well-dressed in a conservative way, articulate, and though I am unaware of her personal origins (part of the deal), she exudes a hoity East Coast Gwenyth Paltrow vibe in appearance and carriage. One of the reasons I adore Dr. T, in addition to her amazing insight and professionalism, is that in her case, appearances can be deceiving. She is not the shrink I’ve been observing on the first season of Mad Men, sitting in a lofty leather chair scribbling notes while Betty Draper droningly free associates. She’s not charging me by the hour while offering nothing more than “Hmm…tell me more about that.” She is deeply involved in the work I am doing – and it’s been hard labor. She’s cried while listening to anecdotes from a chaotic and unhealthy childhood. She’s been stern when I’m not listening in return. I daresay we have locked horns a time or two. She has been known to use bad language when we’re discussing feelings of anger and resentment. It’s actually quite comforting. Dr. T is as street smart in her approach as she is learned, all while maintaining full control and invariably helping me articulate an “a ha!” moment with amazing regularity. She’s at once relatable and authoritative. I’ve been working with Dr. T on and off for over three years now. I came to her a broken 31 year-old woman: utterly dissatisfied in a rote administrative career, burdened and frustrated by a loose cannon of a mentally ill parent and unhappily married. What I thought I wanted and needed at that time was not a way out, a method of setting myself free, but “fixing” so that I could accept my lot. I didn’t want to be the woman who chucked it all and started over – in every sense of the word – at an age when most of my friends and colleagues were settling into stability. But it turned out that’s exactly what needed to happen. I needed to set the prairie on fire. I knew this deep down when I sought Dr. T’s services. My life today bears little resemblance to the existence I knew at this time in 2009. It’s been an awful, harrowing journey in many ways: friends have died, long term relationships have ended, illness, depression, unemployment – you name the source of grief and it’s happened. But amongst the rubble of my former life and methods of coping with it, I am building something new, something fresh and healthy. I’m not ready for the ribbon cutting ceremony yet but I can envision a time when I will be.